See your booking alerts. Set them hidden or active. 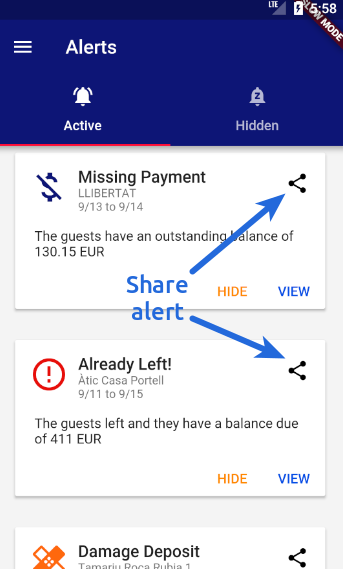 The alerts system is designed to keep you informed about the missing payments of your bookings or situations that require someone's attention such as arrivals and departures. To understand the meaning of the symbols of the alert system, please see the Alerts symbology article. The Alerts view show your alerts ordered by date. It has two tabs. In the Active tab, you can find your not hidden alerts. To hide one, click on the "HIDE" button of an alert and from now on you will find it in the Hidden tab. This is very useful for long-term bookings, were fragmented payments are common so the total cost is not fully paid from the beginning. To un-hide an alert, click on its "UN-HIDE" button so you will find it again in the Active tab. You can also share an alert so you can send it to another person in order to solve the problem. Finally, by clicking on the "VIEW" button you will see its booking view.